What is Ava’s current state of efficacy from a user’s perspective comparing against its competitors? Organizations and corporates are recently getting interested in Artificial Intelligence. Using chatbot as assistant on a company's website is a demonstration of involving this field, while also saving the cost to hire representatives. I am especially interested to learn users' behavior when chatbot intends to help them make purchasing decisions. Can users put trust in artificial intelligence during retail experience? 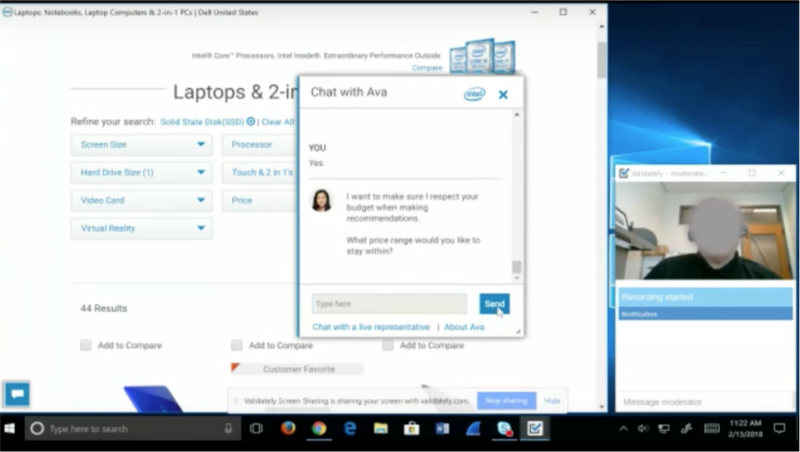 Ava is a virtual shopping assistant on Dell.com. A user can type a message or clicks provided links to start chatting with Ava. Currently Ava is designed to assist users to explore and purchase dell's products on Dell's website. In order to understand Ava's functionality, I examined how Ava works and co-designed an interaction map as follows. After we examined the major functionality of Ava, we decided to test the first flow: help user choose a computer, since it exemplifies how Ava recommends a product through a couple of questions. Our study involved a competitor analysis, testing the usability of Dell’s chatbot (Ava) and HP’s chatbot (the HP Virtual Assistant). Our analysis was non-comparative competitor evaluation. hile Ava was designed to enhance shopping experience, the HP Virtual Assistant was designed to provide tech support. Thus, a one-to-one comparison between the two products is inappropriate. Instead, we evaluated the key delights and pain points as participants interacted with both chatbots, in order to gain insights on how each chatbot has been successful and how the next iteration of Ava could be improved. Measuring scheme: Qualitative metrics such as perceived ease of use, usefulness, confidence, and degree of satisfaction, and Quantitative metrics through SUS. I've covered this participant's face for privacy purposes. 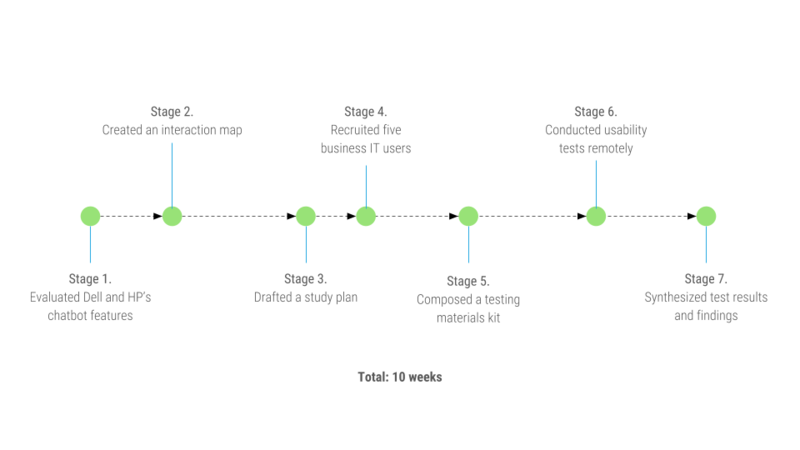 All usability sessions were held remotely, moderated through Validately. As the example shows on the right, participants shared their screens while interacting with Ava. Participants completed tasks testing Ava and the HP Virtual Assistant and were encouraged to think aloud. After completing all tasks, we debriefed participants to discuss their overall impressions of both chatbots, things they liked, things they disliked, etc. (1) Imagine that you are having trouble connecting your wireless printer. Using HP’s virtual assistant, find a solution to your problem. Users doubted the responsiveness and credibility of Ava (and chatbots in general). Participants felt that Ava could not fully address their needs when recommending a product. In addition, one participant commented that he had concerns as to whether Ava was recommending the best product for his needs or the product that would yield the most profit for Dell. Thus, there is a need for Ava to demonstrate better credibility and responsiveness to users’ needs. We recommend that designers consider referring to reviews to establish credibility and making clear connections on how a product meets the needs expressed by users. Additionally, Ava currently only recommends one product after the user answers a series of questions. 4 out of 5 participants either conveyed intentions or did compare options when making purchasing decisions. We recommend future research to examine how many options should be available to users. Additional issues relate to difficulties interacting with Ava’s chatbox. Multiple participants commented that Ava’s chatbox obstructed their view of the web page and experienced friction switching between interactions with the chatbot and interactions with the main web page. We recommend redesigning the chatbot so that it is not in the way of the web page, and to provide affordances to make it clearer how to interact with Ava as part of the web page. Based on research, a SUS score above a 68 would be considered above average and anything below 68 is below average. Dell scores 66, which is slightly above HP. Both Dell and HP's chatbots are under average.